Fraternities and Sororities, officially called National Collegiate Social Greek Letter Societies, have been present in North Carolina since at least 1812 and form a significant presence on the campuses of the state's modern colleges and universities. Greek letter societies incorporate both fraternities and sororities (sororities were originally called "women's fraternities"). Drawing heavily upon Masonic and Phi Beta Kappa Literary Society influences, Kappa Alpha (a different group from the current-day Kappa Alpha Order or Kappa Alpha Society) was founded at the University of North Carolina in Chapel Hill in 1812. Four undergraduate students claiming membership in Phi Beta Kappa used a constitution, a ritual, a badge, and secrets nearly identical to those of Phi Beta Kappa to create Kappa Alpha. This is the first documentation of the founding of a Greek letter social fraternity in the United States. Kappa Alpha, or Kuklos Adelphon as it was also known, grew popular and spread to more than 21 other college campuses throughout the South. Chapters also existed in county seats and consisted of the "professional and gentry classes," who met for "social and literary purposes." Before its final demise in 1866, Kappa Alpha enlisted many prominent men, including President James K. Polk. Chi Psi, Delta Kappa Epsilon, and Kappa Sigma fraternities absorbed most of the Kappa Alpha chapters after the mother chapter of Kappa Alpha disbanded. During the 1840s, there was a national backlash against secret societies in general and fraternities specifically. This movement gained mass support and even resulted in the formation of a political party. In North Carolina during this time period, the trustees of the University of North Carolina passed a resolution banning exclusive and secret societies on the grounds that these groups were detrimental to good morals and sound learning. Students were made to take a pledge against joining these societies and were not admitted to the university unless they did so. While some organizations ceased operation because of this edict, others went underground, perhaps becoming even more attractive to rebellious students of the time. Although the suppression of secret societies worked for a while, by the early 1850s these clubs and fraternities were again operating above ground. Delta Kappa Epsilon, the oldest existing fraternity in North Carolina, was chartered at UNC in 1850. Like most other fraternities, it disbanded briefly during the Civil War. Chi Phi was one of the few fraternities in North Carolina that did not disband. Founded at UNC in 1858, this fraternity expanded chapters to a number of southern states and even formed a chapter in Europe. By 1885 fraternities and secret societies were so prevalent that the UNC trustees reluctantly granted conditional recognition to the groups, which included the stipulation that the groups had to provide the faculty with membership lists and agree not to have socials with alcohol in Chapel Hill. Despite this recognition, there was still animosity toward the fraternities from some students and faculty members. Fraternities were viewed by some as aloof, "destructive of college spirit," and "hurtful to athletics." Despite these charges, student interest continued, so that by the outbreak of World War I, a diverse fraternity system flourished in North Carolina. In 1923 Chi Tau National Men's Fraternity was formed from the union of Chi Tau local fraternity at Trinity College (present-day Duke University) and Lambda Sigma Delta local fraternity of North Carolina State College (North Carolina State University). Approximately ten chapters spanning four states were chartered before dissension led to the demise of this national fraternity in 1929. The first women's National Collegiate Social Greek Letter Society in North Carolina was chartered at Elizabeth City Normal and Industrial School (later Elizabeth City State University) in 1902. This chapter of the Kappa Delta sorority survived for only two years, but the movement toward fraternities for women caught on across the state. The first sororities at the University of North Carolina were Chi Omega and Pi Beta Phi, which established chapters in the early 1920s. In 1911 Alpha Delta Pi, the state's oldest existing women's fraternity, was chartered at Trinity College. Others followed, including Tri Delta in 1943. All sororities have educational as well as social functions, and all are involved with charitable activities. The National Panhellenic Conference, established in 1902, oversees much of the activities of sororities and formulates policies of interfraternity interest and concern; studies changing educational outlooks; and, through discussions, panels, and special programs, contributes to interfraternity understanding and friendship. Each large college campus in North Carolina has a Panhellenic Council, which serves as a unifying force for the sororities. Defying doomsayers, the majority of fraternities and sororities survived Prohibition, the Great Depression, and both World Wars to see their ranks swell, as veterans and women sought higher education and Greek membership in greater numbers in North Carolina. Though the turmoil of the Vietnam era closed some chapters in North Carolina, by the early twenty-first century the Greek system in the state was continuing to grow in size. Most of the state's major colleges and universities have numerous fraternities and sororities, many with a very specific purpose. For example, Epsilon Chi Nu, the first Native American fraternity in the country, was established at East Carolina University in 1996. Jack L. Anson and Robert F. Marchesani Jr., eds., Baird's Manual of American College Fraternities (1991). Albert Coates and Gladys Hall Coates, The Story of Student Government in the University of North Carolina at Chapel Hill (1985). 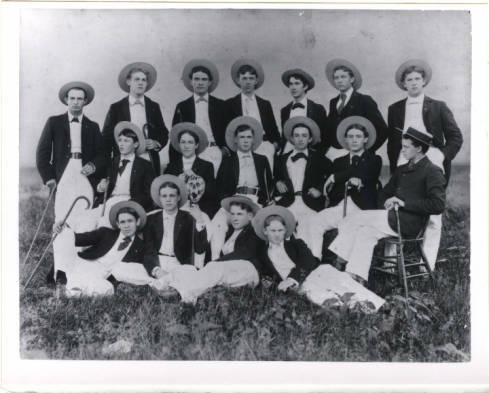 Theta Nu Epsilon Fraternity, c. 1892. Image courtesy of The Carolina Story. Available from http://museum.unc.edu/exhibits/newsouth/theta-nu-epsilon-fraternity-c-1892/ (accessed November 21, 2012).